Drivers in the Town of Middleburgh will have to slow down on a pair of local roadways. 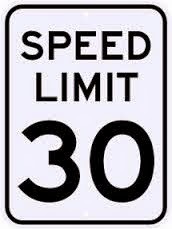 Announcing that the New York State Department of Transportation has recently completed two speed reduction studies on the municipality's request, town officials informed residents of the speed changes at Thursday evening's monthly town board meeting. The new restrictions are limited to Frisbieville and Middlefort Roads and will soon be going to effect. Slicing the maximum speed a motor vehicle can travel on either road down to thirty miles per hour, the Middleburgh Highway Department will be responsible for acquiring the necessary signage to properly post the new speed limit for motorists. Department of Transportation officials signaled a desire to reduce speed on the Town of Schoharie's share of Frisbieville Road as well, but it can only be done so if their municipal board requests a study be conducted on the merits of a possible reduction.